Phase III deals with the drawers, there will be 8 drawers in total which will be located on the 2 sides. The drawers increase size as you go down the cabinet starting at 4”, 5”, 6-1/2” and finally 8”. Cut all drawer parts to size. 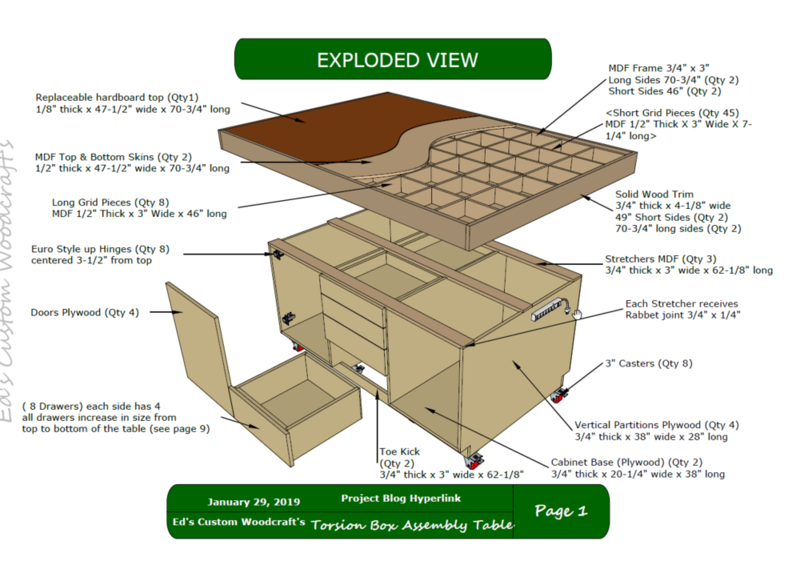 The most exciting part of this phase of the build is that I actually get to use the assembly table to build the drawers. Using my plans I cut all plywood parts to size, I used a mix of birch plywood and regular sanded plywood for all the drawer parts (needed to get rid of some scrap plywood, that’s why I used the sanded plywood. 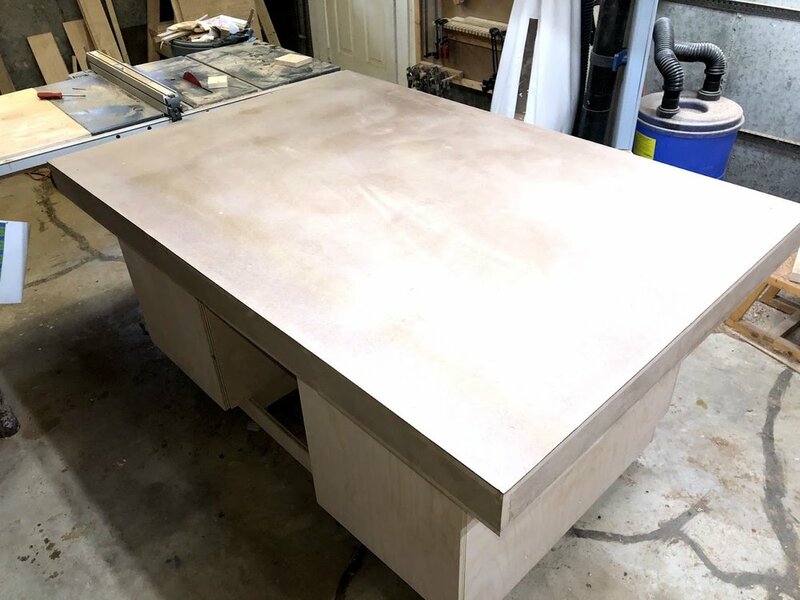 With the exception of the drawer bases all materials were 23/32” thick, the drawer base was 1/2” thick I needed very robust bases as I will be putting heavy tools in them. I used my table-saw to rip cut all the drawer parts and cross-cut most of the drawer parts on my chop saw with the exception of the drawer bases which I used my crosscut sled on the table-saw. Drawer frame cut to size, since I am using 4 different heights of drawer that is why there is 4 lots of parts. I was so happy that I left this final part of the build for last as I get to actually use my assembly table for its first project, its drawers. Its extremely handy having a longer work surface. 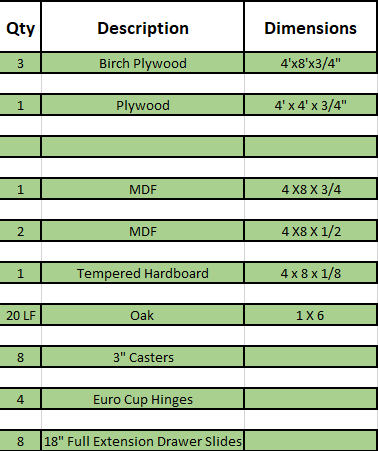 Here are the 8 drawer bases all cut to size. I chose to use the same joinery method as “The Wood Whisperer” did in his build for the drawers and that is the rabbet joint, with a dado for the drawer base. 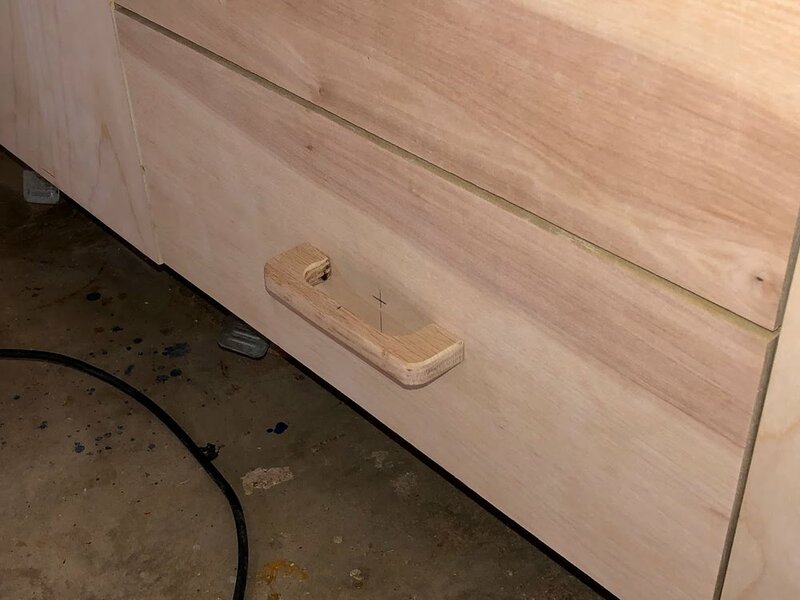 Basically cut a rabbet on the front and back drawer pieces which is where the drawer sides are captured and then I use glue and brad nails to secure all the parts together, the drawer base just sits into a dado that is 1/2” up from all 4 sides and I made it 1/4” deep. This method is extremely quick and I banged out all 8 drawers in about 2 hours. My first step was cut 2 rabbet’s on each side of the front and back drawer piece, its a 1/2” deep and 23/32” wide, I installed a sacrificial fence to my table-saw fence and then also installed a dado stack in my saw to get the job done. I only placed rabbets on the front & back pieces of all the drawers, the sides do not receive the joint. 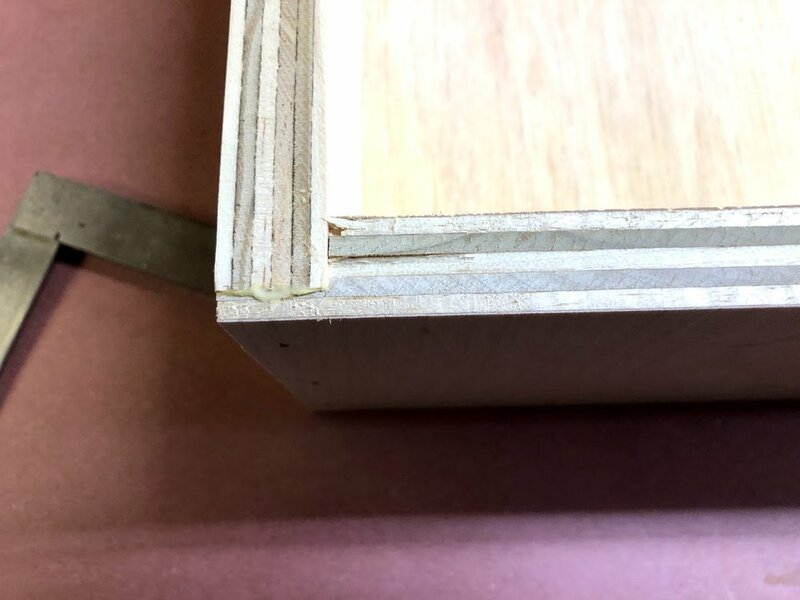 Here is a close up of the left side rabbet, that 1/4” front piece is what hides the joint on the front when it is all glue together, it also enables you to have more glue surface for a better bond on the drawer. 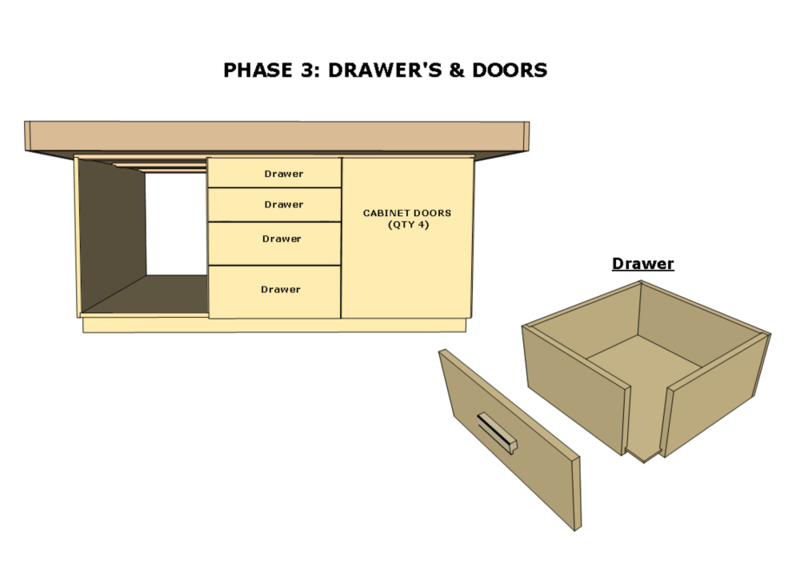 Here is what the drawer front& back pieces should look like. My next step was cut the dado for the drawer bottoms on all drawer pieces, I placed the dado 1/2” up from the bottom and the dado is 1/2” wide and 1/4” deep, I also used my dado stack for this step. Here is a close look at the dado which is where the drawer base will be housed, this panel will float in here so no glue will be needed during the glue-up phase. After all the joints are now cut in all the drawer pieces I sanded them with 120 grit sand paper using my random orbital sander. I usually only sand the inside faces of the drawer parts and then sand the outsides of the drawer once all the glue has dried. Now that all the drawer parts are ready for the glue up I usually do a dry assembly to make sure that I rehearse the order in which I assemble the drawer, I also make sure that the drawers are square, which they were. Here are the drawer parts al laid out for assembly, I place glue on the drawer back & front and then assemble the drawer and secure the corners with 1-1/4” brad nails. 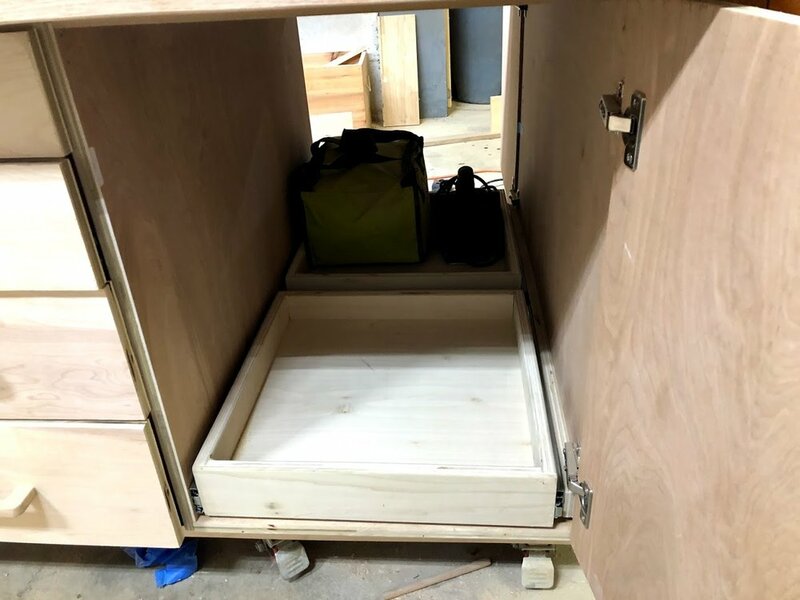 Installation of the drawers was pretty quick and easy, I used 18” long side mounted drawer runners on all the cabinet drawers and I came up with a quick installation method for them, I made a quick jig for the drawer slides to help with alignment. The drawer runners I used had 2 parts to them, one part gets screwed to the case and he other gets screwed to the drawer there was a 1/2” overlay between the 2 parts so a made a offset jig that I could align the drawer part so as that they were uniform on every drawer. STEP 1: I used a 1/4” spacer so as that I could sit my drawer slide on and keep an even reveal. With the jig butted up to the base of the drawer I just lay the drawer slide next to it and screw it in place with 3 screws. Here is a close up of the jig, its basically a scrap piece of plywood with a fence on the side that is 1-1/4” wide which when butted next to the 3/4” thick plywood gives me the required 1/2” offset to install the drawer slide. Here are all the 4 drawer box installed on one side, I repeated this on the other side of the assembly table. 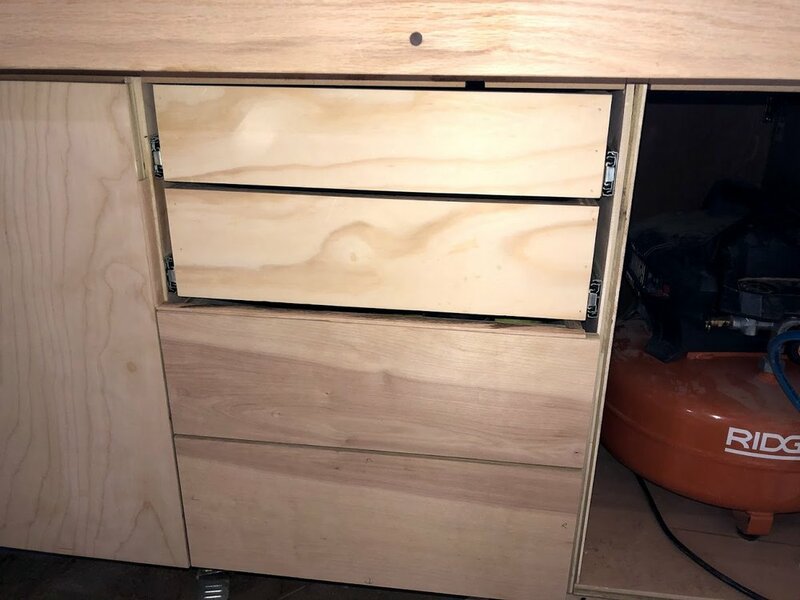 I made sure to use a single plywood panel for all my false fronts so as that I could cut them sequentially and maintain the grain pattern for all the fronts, I really think it adds that cohesive look to the bank of drawers. The installation of the false fronts was very easy. Finally secure with 1-1/4” screws from inside the drawer. 2 false front installed, as you can see the grain matches up as you look at the drawers. Here is a picture of all the false fronts added on one side, I repeated this on the other side, it looks great, next up is attaching the handles. If you can remember I made my own solid oak drawer pulls a little while ago and it was time to install them on the drawers and doors. 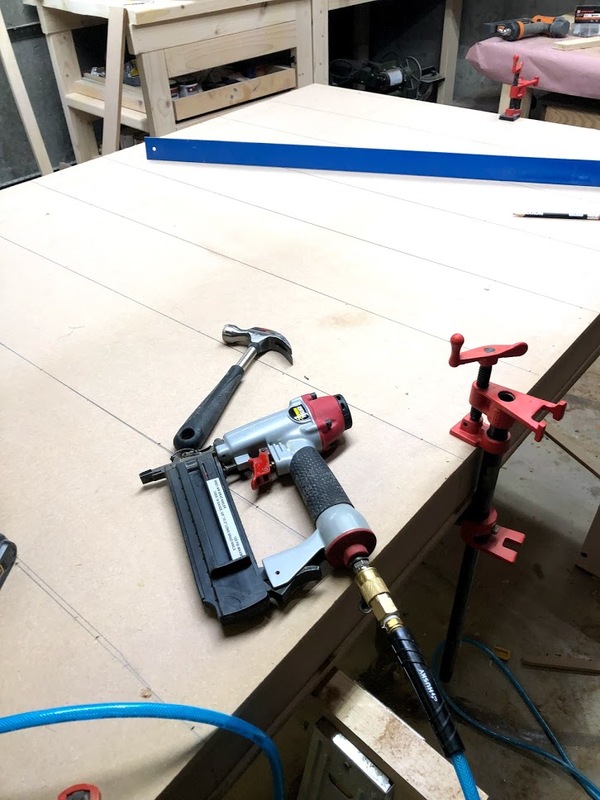 I purchased a Kreg jig some time ago while I was making my drill press cart and it was time to use it again, this is a great little jig if you install drawer pulls, and it works great every time. With the center of the drawer marked I lined up my Jig and predrilled the 2 holes required to secure the drawer pulls. Holes predrilled, all that was left was to secured the pulls with 2 screws from the inside of the drawer. Here are all the oak drawer pulls attached, still need to sand the pencils marks . With all the drawers done I turned my attention to installing the pulls on the cabinet drawers. The Wood Whisperer design had some shelves on the inside of the cabinet doors but I didn’t think that would work in my situation, so I came up with a plan deviation and that was install pull out trays , they are basically very shallow drawers and are installed as drawers because they operate on drawer slides. They allow my to utilize all the empty space behind the cabinet doors but have easy access to all contents instead of reaching into deep shelves and having a hard time finding what you are looking for. I installed 4 pull out trays behind the left cabinet door, and I will be storing anything from my power tools that are too big to fit inside the drawers, I will also be storing my wood finishes and glue. I made them the same way that I made my drawers except they don’t have false front and are only 3” deep. They work great and have so many uses, I have used them in my kitchen on more than one occasion. The trays are very shallow, but the design and joinery method used are the same as the big drawers we just installed. Here is one of the trays installed, works like a charm. I made a total of 4 trays and loaded them up with all my stuff. The name of the game is access, these work great ad better than any shelf in my opinion. 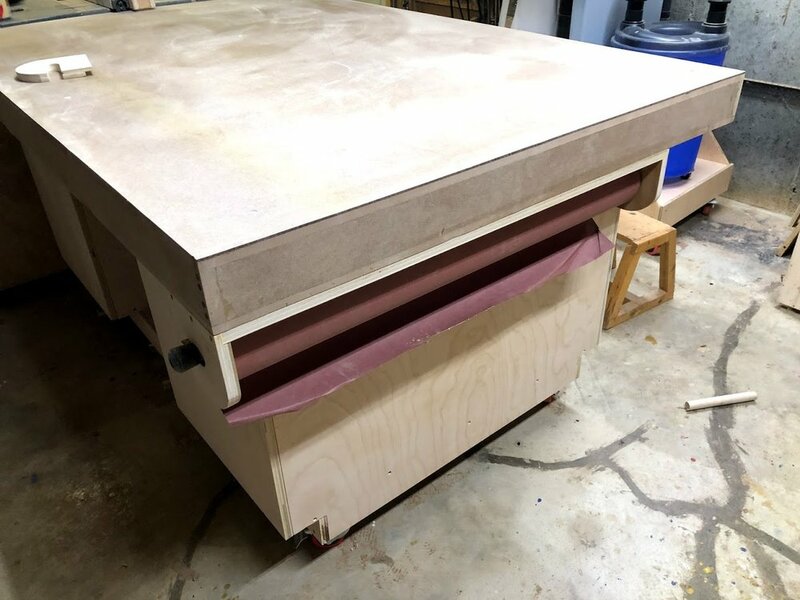 On my last outfeed assembly table I had made a home for my 36” long roll of resin paper, I used this to protect the top of the table when I was either gluing up a project or applying finishes. I found this design on Jays Custom Creations, I will include a link below to his build video, although mine is very similar I didn’t use finger joints for the joinery method, I basically used glue and screws and rabbets to hold everything in place and it came out great. 1” thick dowel, 3 pieces of plywood (2 sides and a top mounting piece. 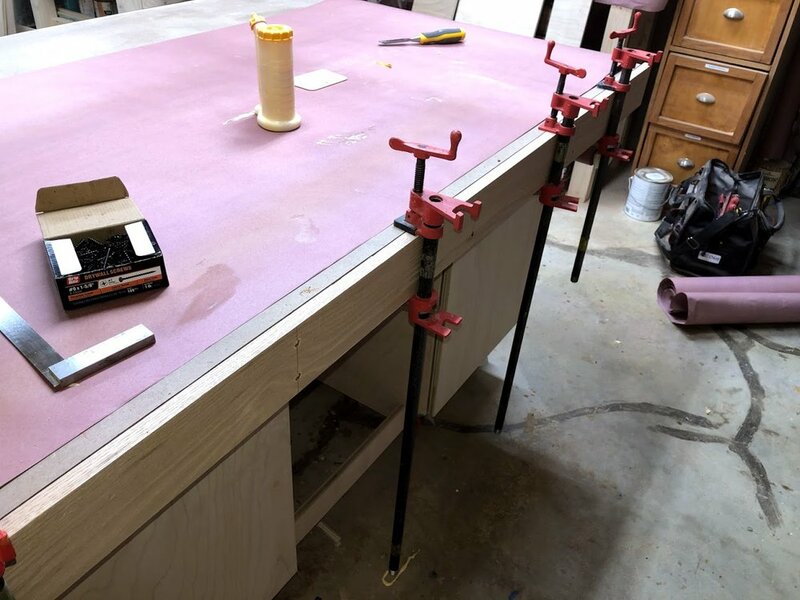 Phase III is all finished and we have a very functional assembly table with tons of storage with a variety of storage methods and a large assembly work surface. My final stage of this huge build is to apply the finish and I will do that soon, this will probably take me a week to fully finish as it takes a while to apply polyurethane while sanding between coats, but when that is done I will post a finished article on the build. See you next time and thanks for reading this long project blog, I really hope you got something out this project. 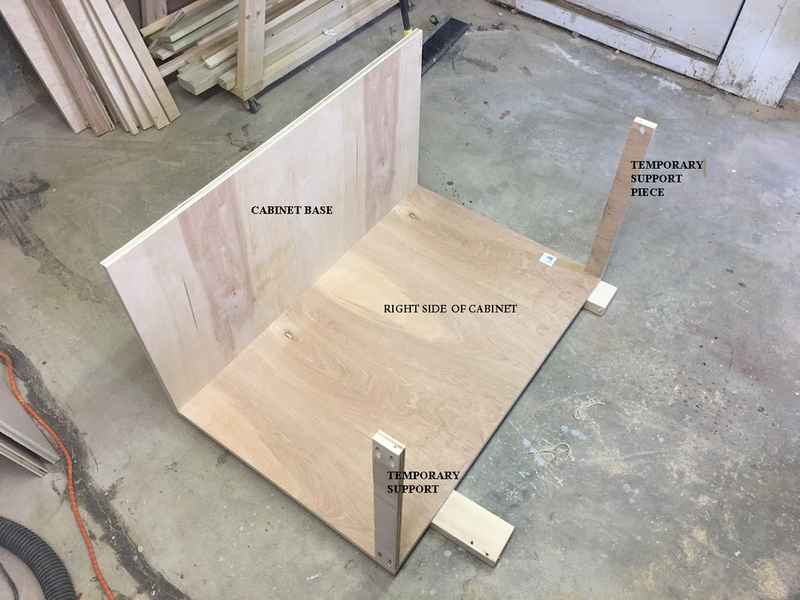 Phase 2 of the project deals exclusively with the Torsion box top that will be installed on top of the cabinet base that we made in Phase 1. 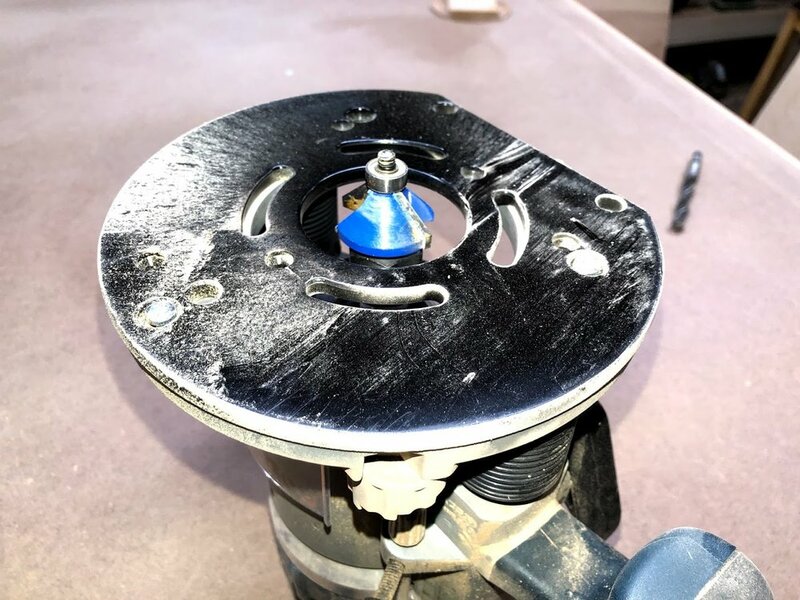 A torsion box top is extremely functional in that it’s basically a shallow box with a grid work inside that provides a very flat stable surface to work on. 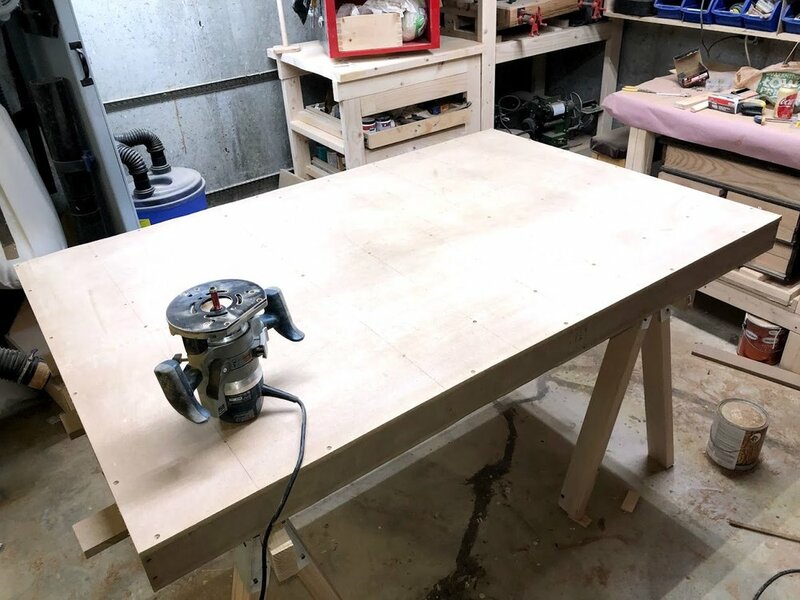 In order for me to assemble the torsion box I needed to take down my old outfeed table so as that I had some room to work, but you needed an assembly table to make an assembly table. So I went to my big box store and got a couple lengths of 2x4’s and I also got some metal saw horse brackets that were really cheap and quick to make into saw horses. It took about 15 minutes to make these, not bad. Here is a close up of the actual bracket, crude but effective. So now that my saw horses are made, its time to make my makeshift staging area so as that I can start to assemble the top. Below you can see that I added 4 long work supports this was done to make sure that the MDF sheet that I will be put on this is dead flat, there was no point going through all the trouble of shimming the saw horse legs and make them level If they top that the mdf skin was sitting on wasn’t level. This is the MDF skin that I through up onto the saw horses, this will be one of the surfaces of the torsion box, but for right now it is my temporary assemble table. Before I get started making the outer torsion box frame I applied a coating of paste wax to the MDF panel that I will be making the torsion box on so as that glue will not stick to it as this will eventually be the top surface of my top. 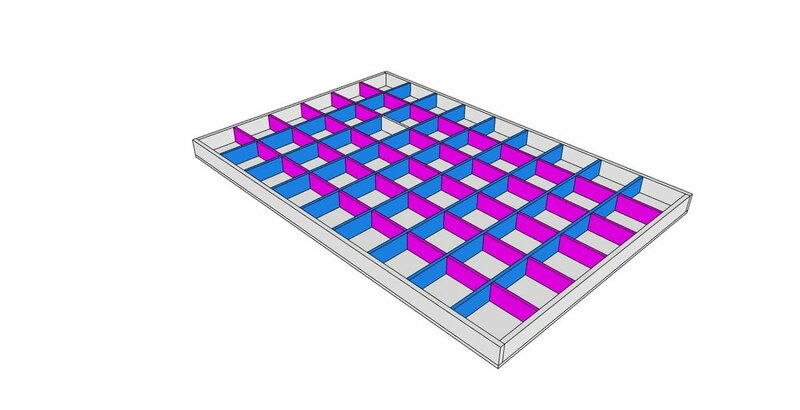 To describe the frame I am referring to the pieces that go around the torsion box grid, as show in the image below, the grey pieces represent the torsion box frame, these pieces wrap the torsion box grid pieces and later in the process I will attaching solid wood trim to them. Two short pieces for the top and bottom of the torsion box. I used glue and screws to secure the long frame pieces into the shorter ones. The grid was the most time consuming part of the torsion box top, mainly because of the number of parts that needed to be cut, glued and brad nailed into position. The grid consisted off: 45 short grid pieces and 8 longer pieces. There were 9 rows of small grid pieces that measured 7-1/4” wide. My process was simple enough but took a while to complete. Here is an image of the grid completed. The skins are what make up the top and bottom surfaces of the toson box, I used 1/2” thick MDF pieces as they are one of the most flat panels you can purchase and they stay flat as well. Applied glue to the tops of the grid pieces that were completed in the last step. Marked out by drawing lines with a long ruler where the long grid pieces were located so as that I could attach the skin into these pieces, almost like clamps until the glue dried. After the glue had dried after a couple of hours I flipped the torsion box over and added the other skin in the same manner. I left the skins a little oversize so I came back with my router and flush cut router bit and made the skins flush with the outer frame. Added glue on top of grid pieces. Using my drywall framing ruler I draw visible lines to show here my grid pieces were located, that way I could anchor the top with brad nails . After the skin is installed I also added a few screws and then using my router I flush trimmed the top making sure that all edges lines up.. I will be attaching my solid wood trim to the outside of the torsion box by the end of the project. Now that the torsion box is built it was time to install the hardboard cover, this is only getting screwed into the skin no nails or glue was used because as time goes by the top will be beaten up and I will want to replace it. Hardboard top installed, just needed to flush trim it and the box is almost finished, I need to go to my lumber supplier and get some red oak for the outside edges of the torsion box. With the torsion box completed it was time to marry the torsion box with the base cabinets, it was very easily done but help from a friend will be needed as the torsion box is not light. I moved the torsion box from the saw horses and attached it to the cabinets using screws from the underside of the stretchers that we added in phase one. Torsion Box attached to the cabinets. A close up of the cabinet base, the oak will look awesome on the top once I get it, there isn’t any hurry. I needed 4 pieces of solid oak, two long pieces for the sides and 2 shorter pieces for the ends. I purchased a total of 20 feet of 1x6 solid oak and ripped it down to its final sizes. I decided to do a little layout to keep all the screw holes in the same location as yo went around the table, so I used my measuring tape to position the holes and my combination square to mark the center points for the holes. Then just used m drill with a countersinking bit to drill the holes. Phase 2 is a wrap next up is Phase 3 which will be making the drawers for the cabinet base. I really hope you are enjoying this lengthy project but we are in the home stretch. Here you can see the lines that I drew to locate where the holes where to go, they are in the same distance apart on all sides. Now that all my holes were drilled I needed to secure the trim , I used a trick that The Wood Whisperer used when installing the trim when you are along and that was to add clamps to the torsion box so as that the trim can balance on the clamps when you need to screw the trim place and it worked great, I also added glue to the back sides of the trim and the torsion box sides. Here you can see the trim balancing on the clamps, just need to add screws. I wanted to use a contrasting wood for the dowel plugs so I picked up some walnut dowel rods and chopped them up into little 1/2” plugs. My process for this was very straightforward and I really love how they come out. Added glue to the counter-sunk holes and tapped in a dowel, I left the dowel proud so as that I could trim them flush after the glue dried. Dowels are flush cut and sanded smooth and really like the look. Here is the walnut dowel left proud, just waiting for the glue to dry. I decided to also add a router profile to the trim so as that to remove any sharp edges from the oak, I decided to use chamfer profile bit in my handheld router to this. Really glad that I went with this profile as it also adds a nice characteristic to the trim, I could have used a round-over bit but I thought that would be a little boring. Finally here is the finished Torsion box with solid oak trim. Here you can see the chamfered edges, I did this to all outside edges of the oak trim. All that was left was to sand the trim and break the other edges of the oak trim with 120 grit sandpaper and I called it a day. I have to say that I really love this torsion box and glad I spent the little extra in choosing solid oak for the trim , the walnut plugs also add a nice look to the top.